Her sound isn't like most pop music today; it stresses melody over rhythm, prefers lush textures to harsh tonalities, and puts its faith less in the glitter of wordplay than in the pure emotive power of sound. At its best, her music combines the melodic resonance of folk, the compositional integrity of classical, and the ethereal beauty of New Age music, making Enya a virtual category unto herself. Combination: Her work melds qualities of folk, classical and New Age sounds. By J. D. Considine, Sun pop music critic. NEW YORK -- For someone who has sold more than 20 million albums worldwide, Enya certainly has managed to keep a low profile. You won't see her night-clubbing with Madonna or touring the Amazon with Sting. She hasn't sat in with U2, jammed with the Stones or done a black-tie benefit with Luciano Pavarotti. She hasn't done Letterman and is almost never found in the pages of People. About the only place she ever does show up, in fact, is in people's CD collections. And frankly, that's fine with her. "There are some artists whose name is bigger than their music," says Enya. "You know of them more than the music. But the thing about me is that people know the music more than they know anything about me." She laughs. "Or what I even look like." For the record, she looks great. With her short brown hair, bright hazel eyes and strong, Irish features, she's beautiful without being showy about it, while her carefully tailored suit - a marvel of artfully stitched brocade and black velvet that glints aubergine in the sunlight - conveys both classic elegance and contemporary style. But the Enya most people come in contact with is a purely aural experience. Her sound isn't like most pop music today; it stresses melody over rhythm, prefers lush textures to harsh tonalities, and puts its faith less in the glitter of wordplay than in the pure emotive power of sound. At its best, her music combines the melodic resonance of folk, the compositional integrity of classical, and the ethereal beauty of New Age music, making Enya a virtual category unto herself. Her music may be unlike anything else on the pop charts, but that certainly hasn't kept it from selling. Since the release of her 1988 album, Watermark, Enya has been something of an underground sensation, selling millions on what has amounted to mere word of mouth. True, 'Orinoco Flow' did clamber into the Top 40 in '89, but neither her 1991 album, Shepherd Moons, nor her current The Memory of Trees has been a radio or MTV favorite. Not that she ever worries about such things. "It's kind of a different world altogether," she says of her recording process. "You have to sort of forget about the audience, the success, and just let the music take you on a journey." In her case, that journey began in the Gaelic-speaking part of County Donegal, Ireland. Born Eithne Ni Bhraonain - Anglicized, that's Enya Brennan - in 1961, she was one of nine children, and hardly the only musician in the bunch. Sister Maire and brothers Ciaran and Paul were the first to make names for themselves, having formed a folk group called Clannad with their uncles, Pat and Noel Duggan. Clannad had been recording for half a dozen years by the time Enya joined up, in 1979. "I was only with them for two years," she says. "It was definitely an experience for me, because I went from studying music to being on stage and doing tours. I really enjoyed that, but musically I felt restricted. They veered more towards the Irish traditional music, and I wanted to explore more." Fortunately, the ideas Enya had of translating her classical training into something more individual and inventive had a lot in common with the ideas Nicky Ryan had about record production. "He was producing [Clannad's] albums at the time, and we talked quite a bit," she recalls. "He had this multi-vocal idea, which fascinated me so much. I've always had a great love for harmony, and he knew that, so we used to talk a lot about it. And after about two years of going on tour all the time, I felt, musically, I wanted to do something. So myself and Nicky got together." At first Enya just wrote, composing the score for a film called The Frog Prince, though someone else did the arranging and orchestration. Not long after, she made her first solo recording, an album of soundtrack music from BBC film The Celts. That's the point at which Enya and Ryan began applying the multi-vocal approach they'd long discussed. "It was really strange, because we didn't know what we were looking for," she says. "Yet we knew, when we actually came across the sound that this was what we were looking for. And the strange thing is, to this day, that's what it's like working with multi-vocal. You never know what the end result is going to be like, because each melody is different." Multi-vocal is just that - a tapestry of vocals, layered each over the other in a string of overdubs. The effect is not unlike the sound of a choir, but the process is totally different, for instead of simple three- or four-part harmony, Enya will put down dozens and dozens of individual vocal tracks, depending upon the demands of the specific song. "Any time I go in to sing multi-vocal, I do it spontaneously," she adds. "I just listen to whatever was recorded firstly - if it's piano or some strings or percussion - and then I'll go in, and just enhance what's there. "But you actually have to sing all those vocals before you know if it's going to work or not. You sit down after singing maybe a hundred voices, and you sit down and you think, 'No, this isn't working.' So you erase it. Or else, 'Yes, it's working, but we want to do it this way.' Or else, 'Yes, it works.' There's no shortcut to it." As a result, it takes more than a year of steady work to make an Enya album. Some of that comes from the rigors of the creative process, as Enya plays through idea after idea before finding a melody worthy of being made into a song. "It just has to be special to me," she says. "Even though I can be at it for days and days - or weeks, or months - that moment when I write the melody, that's the reward for all those days that I've sat playing piano or singing." Mostly, though, it's the recording process that takes time. 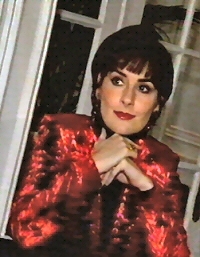 Unlike some studio-savvy solo artists who use computers to piece the music together with clockwork precision, Enya insists on getting "live" feel from the music. So she refuses to rely on sequencers or even a metronome-like "click track" to lock overdubs into perfect time. "Because I'm the main performer, I know exactly the way I wrote the melody, and I know exactly how I want to perform it," she says. "And that's the way I'll always perform that melody. So there's a lot of emotion [in the music]." Melody lies at the heart of Enya's compositional process. She starts there, and builds everything else - the harmony, the rhythms, the arrangement - from that base. Even the lyrics tend to play second fiddle and are generally added after the main melody has been composed. "Again, we're enhancing the melody," she says. The words in Enya's songs are written by Ryan's wife, Roma. "What's great, with Roma knowing me so well, is that when I play her a melody, she knows exactly what I'm trying to say lyrically without my having to say anything to her," says Enya. "So it's wonderful for me to sing. When I see the lyrics, I just know that it's going to be something that is in some way related to the melody. "I've always had a great love for a strong melody," she adds. "It's actually a combination of Irish traditional music combined with classical music for me. I feel that both of those elements in music have that inherent in them." Ultimately, that - not the sales her albums earn or the fame she's gained in spite of her low profile - is why she cherishes the time she spends writing and recording. "My first love is for music," she says. "I also think it's important to do music. You have to make sacrifices because of that, but the end result is so rewarding that it's worth it. I mean, that's what you're trying to achieve: music that you're happy with." Note: Transcribed by Brian Baranoski and posted to the Enya Mailing List on March 17, 1996.